I admit – I do tend to give a fair amount of gift cards! For birthdays, Father’s Day, Christmas – sometimes, you just don’t know what the ‘perfect’ gift could be – so you decide to let the recipient make that decision! 🙂 Besides, when you get to a ‘certain age’, you tend to already own most things that you *need*. So a gift card can be perfect for those spur-of-the-moment purchases when you come across just want you *want*! One of the most common gift cards I give is for Starbucks, or Tim Hortons (a favourite Canadian coffee place!). Of course, Stampin’ Up! has the best stamp sets to use for making coffee gift card holders – Coffee Cafe, and Merry Cafe! We created this one in my Stamp & Sip class last week. The photo above shows the gift card holder closed (sort of!). You start with a Soft Sky cardstock that measures 11″ x 4 1/4″. Then, score at 2″ and 5 1/2″. To create the pocket for the gift card, first fold at the 2″ score line. Then, fold at the 5/12″ score line (that folds the card in half). The 2″ that is folded inward will become your gift card pocket – or you can fit cash in there, too! 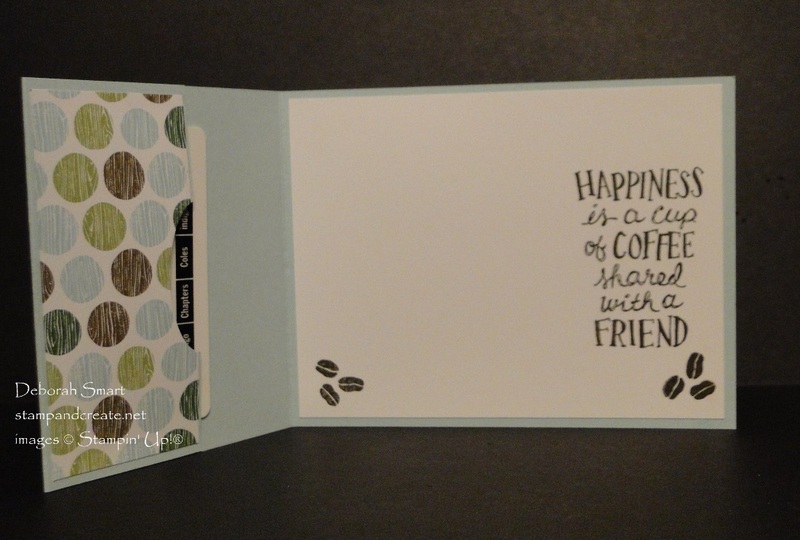 Cut your Coffee Break Designer Series Paper to 3 1/4″ x 4″ for the front panel, and 1 3/4″ x 4″ for the gift card pouch. For the inside panel, you’ll need a piece of Whisper White cardstock that measures 5 1/4″ x 4″. Stamp the outline of the coffee cup, sleeve and lid in Crumb Cake ink, and the coffee beans in Soft Suede ink, onto Whisper White. Use the Coffee Cups Framelits and Big Shot to easily die cut them, and the ‘drip stopper’ from Soft Suede cardstock. The background oval is die cut with the Stitched Shapes Framelits. After the die cutting, stamp the ‘for you’ sentiment from the Birthday Blooms stamp set, in Soft Suede ink. For the inside panel, stamp the sentiment and coffee beans in Soft Suede ink, keeping to the very right side of the panel. That way when the card is closed, the sentiment can still be read. Now you’re ready to put your gift card holder together! First, assemble your coffee cup. Attach the sleeve with Stampin’ Dimensionals, and the lid and stopper with Mini Glue Dots or Liquid Glue. Next, attach the panel of DSP to the front panel of the card, using Liquid Glue. 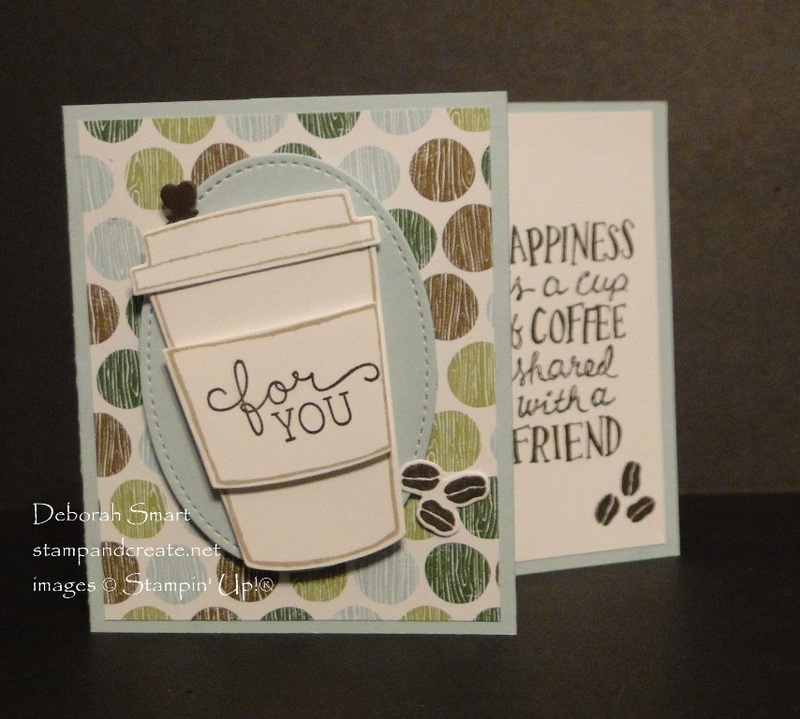 Attach the oval die cut to the centre, using Dimensionals, then add the coffee cup on top of that, again with Dimensionals. Finally, add the coffee beans to the bottom right of the cup. Next you want to create your gift card pouch. Open up the card, and attach the strip of DSP to the 2″ cover of the pouch. Take the a small Layering Ovals Framelit, and die cut just 1/2 of the oval shape into the panel. This creates a space to reach in & pull out the gift card. See the picture below for example. To keep the pouch secure, attach Tear & Tape ONLY along the left & right sides. This will allow the gift card to easily slide in/out. Next, you can attach your stamped inside panel – and your perfect gift is ready for giving! Of course you can switch up the paper, stamp set and embellishments you use for your gift card! Make it for Christmas using the Merry Cafe set (still coffee) or any other set to suit the occasion. Now is the time to get ready for holiday gift giving, and those special occasions that come right after Christmas! Order your supplies so you can start making yours now 🙂 Click on the images below for the supplies used in making this gift card holder. Or click on my signature to browse my online store. Remember that the Buy 3, Get a 4th Free Designer Series Paper Sale is going on until Oct. 31st! Perfect for getting the patterns you want for your gift card holders! Plus if your order equals $375 or more (before tax/shipping) you automatically get a FREE Merry Patterns stamp set! Next Next post: Another Coffee Card! Great gift card card, Deborah. I love the fun fold part! This is a perfect gift card, Deborah! Coffee Cafe is one set I’ll never get rid of!